The topper of the maudlin list? We were all convinced my mother was "not long for this world" - as she would have put it. Skin cancer. In 1999 she moved in with me for a year. 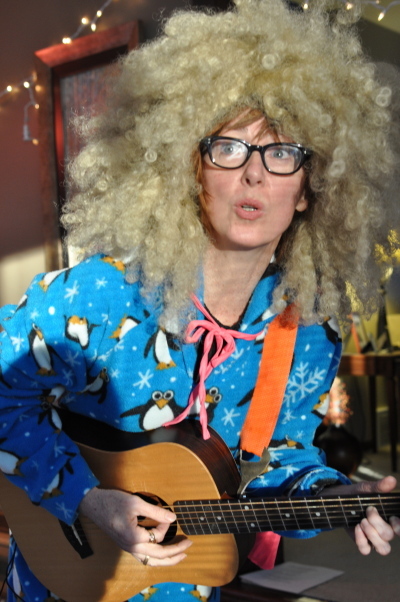 My play "My Mother Has Four Noses" covers some of what happened in that time. There were awful, harrowing stretches, and there were also times when her humor and spirit just stopped me in my tracks. She restored ME. Her incredible resilience, and love.... I know how lucky I am. Needless to say, each time I'm here, those feelings flood back. Our mother daughter schtick - (we were partners in her wacky show) - and the sticky impasses of each of us holding our respective ground over the larger questions. We did a little workshop of "4 Noses" Sunday evening. My first time trying the show "off book." I was terrified when I started, but the audience was stellar. They got the 'funny' - they got the 'tragic absurdity' - I keep saying this, but it's true. I am so grateful for those of you who are supporting in myriad ways the development of this story. It feels precious, in the best way, and I can't thank you enough for your kindnesses in this long process. I was supposed to begin mixing my new record this week while I was here. But it turns out Bruce Springsteen needed some time with my mentor and champion Bob Clearmountain. And when Bruce calls, we all listen!! So we will now be mixing in May. I will try edit together some clips of the "reading" to share with you all soon. 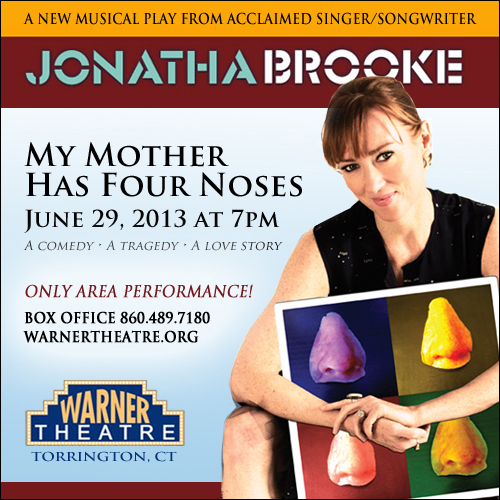 Meanwhile, tickets are on sale for the Torrington, CT DEBUT of "4 Noses" June 29!!! Til then, Thanks so much for your patience. This is how I get ready for the show... I am, after all, my mother's daughter. I'm doing a workshop in Los Angeles this Sunday, cannot WAIT for that. Thanks so much to Sara Hannafin and Alex Wetmore for taking a chance on my little project and going for it in Torrington. I hope you ALL can come. This will be a blast! And there are VIP tickets available, champagne, chocolate, after party...The Whole SHEBANG! As always, thanks for your support, patience, belief! On the way to the train the other day I overheard an earnest little boy ask his mom, "The lightest thing in the world is air, right?" I thought, "Well, yeah, but then there's love...that can be even lighter. In the best way, it really does lift you up, almost better than air." 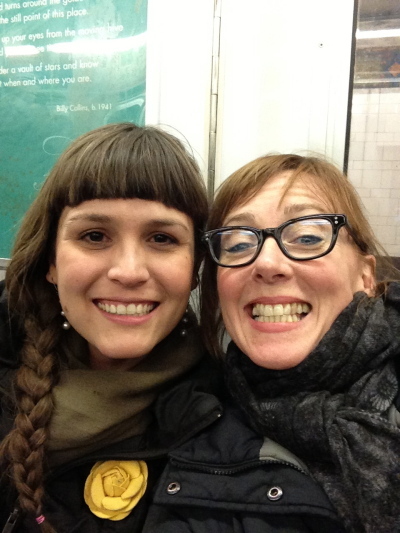 Later, I met the most incredible being on the 2 train. Camille Harris. Crazy cool bangs and braids, a yellow fake flower on her coat. "You have been my life's soundtrack! I love you. I saw you first at the Boulder Theatre when I was like 7. My dad loves only you and Pat Metheny!" These are moments that always pull me from whatever murk I'm wallowing in. These are the gifts that restore my bruised and battered ego from whatever insults the day has wrought. They always come at the right time. Camille? Enchanting, glowing. She told me she is a singer. Working on her next record too...She calls what she does "Silly Jazz" - in fact later when I went to her web site I got sucked in to her outrageous song called "The Muffin Man." Actually, It seems she's written a whole play about the muffin man!! And then, what really killed me was her song "Meanie." She is getting married this summer and trying to figure out which Jonatha Brooke song she will use for her first dance. When I said "All You Gotta Do Is Touch Me" she said, "Yeah, but no, I mean that would be really creepy with my DAD!" I love Camille too. I hope I see her again.